You are at:Home»What The World Eats»What Makes a Great Potato Chip? Some call them chips. Some call them crisps. Whatever you happen to call them, there’s undoubtedly a favorite one you have. It might even be your go-to snack! I’m a big potato chip fanatic myself and there have been a few countless favorites. At this very moment, I’m snacking on a few Ruffles Rugged Edges Bacon & Cheddar that are pretty awesome! My all time favorites, however, are a retired flavor from the Lay’s Bistro Gourmet line. I was known to eat an entire bag of their sharp cheddar and jalapeno chips in one sitting. I’d watch baseball just to have an excuse to eat the chips! 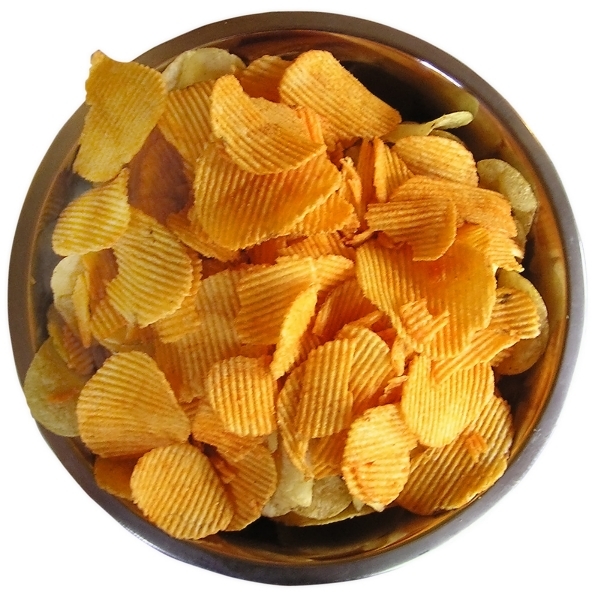 Not all potato chips are created equally, however, and some chips are downright unhealthy for you. Outside of the fact that if you eat a whole regular-sized bag you’re getting 4 bajillion calories, there are some ingredients in the average chip that might make you cringe. Let’s take a look at what makes for a great potato chip. Astute observers will quickly note that the potato chips I’m eating while writing this actually have monosodium glutamate in them. MSG is a flavor enhancer that is typically associated with Chinese food, but there’s a lot of potato chips that have them as well. That’s why you can’t have just one! According to the Mayo Clinic, there isn’t any definitive link to the reported side effects that MSG has reportedly caused. They do say, however, that some people may experience short-term symptoms like upset stomach, headaches, tingling in the face, and other unpleasant symptoms. Baked Chips? A Healthy Alternative? Those baked potato chips send a chill up my spine. No – not because I’m feeding an addiction when I eat them. I shudder because they taste about as good as eating a salted cardboard box! If you can stand the flavor and the texture, you’re in for a treat because the baked chips tend to have more potassium in them then their fried and tastier counterparts. There’s also less fat per serving in baked chips and some varieties offer a boost of Vitamin C as well. What ultimately makes a potato chip rise to the top or fall to a pitiful failure is the flavor of the chip. If you’re getting cheese-flavored chips, you want some extra powder on your fingers, right? If you’re eating sour cream and onion, you should be caked in cream and onion powder. Those barbecue chips? You should be able to baste some spareribs with your fingers when you’re done with them! There’s also got to be a uniqueness to the flavor. Ok – so nacho cheese is good, sure. If given a choice, however, I’ll take garlic cheesy bread chips every single time. Cheddar and sour cream? That’s a winner for me! Being too unique, however, can be a problem. The fried chicken and waffles flavor… too unique. Did you know that in the United States alone, there are over 100 different brands of local potato chips that are stocked on just regional store shelves? Some of these chips are downright amazing and deserve the extra price associated with them! The best one I’ve ever tried is from Rocky Mountain Natural Products. Their jalapeno fiesta chips give you a genuine kick in the pants through your tongue with a beautiful combination of sweet and spicy. The benefit of the local brand is that you’re generally getting local ingredients, fewer preservatives, and you’re supporting local jobs with each purchase. The final aspect of a great potato chip is the thickness of its cut. Those thin, spindly potato chips that crumble in your hand might taste great, but they make a better batter for baked chicken then they do an actual chip. A potato chip should be thick enough to resist handling breakage, crunchy enough to provide you an awesome eating experience, but not so crunchy that you end up giving yourself outpatient oral surgery when you bite down on one. Curved over potato chips? I’m looking at you here. This is the one downfall of the local chip. They’re often fried in bigger batches to create bigger profit margins and this folds over the potato chips while frying. No matter where you stand on GMOs, the fact that some potato chips have begun labeling their products as being GMO free is helpful to some customers. If you want to avoid GMOs in your diet, you no longer have to completely exclude the potato chip these days. That is a beautiful thing! Do you have a favorite potato chip? Let us know what chips have the best potential to ruin your diet!